The purists of sound and video quality have a new multimedia player to adore, DirectDVD, this software has been specially developed with that kind of person in mind, and it puts special emphasis on the playback quality. For this purpose, the application's developers have collaborated with various sound and video research laboratories. 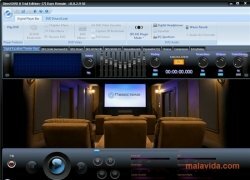 This software's excellence has taken it so far as to integrate many of the technologies that were usually reserved to movie theaters, emulating them so that any computer can manage the maximum clarity and sound quality. DirectDVD includes features to modify the playback and simulates a movie theater as much as possible, including reverberations and other effects that are common to big cinemas. DirectDVD's interface is very professionally designed, showing us the playback controls and visualization and sound options, with almost all the configuration a couple of clicks away thanks to the implementation of the Ribbon interface. The trial only last for 7 days.